What is the best QR clamp design for the nature / wildlife photographer? Over the last six months I have received so many questions about various Quick Release clamp designs I decided closely examine the two most common designs, standard knob style and lever style. Some nature photographers have blogged that one style being better than another so its time to look at the facts so you can decide for yourself. Since my current head of choice is the Jobu Design JR 3 gimbal head I thought I would start by asking Jobu for more details on their clamp designs and the pros and cons of the knob vs lever clamp types. Why does Jobu choose a knob type QR clamp design over a lever QR style clamp? guarantee a secure fit with every brand on the market. For customers holding thousands of dollars of camera equipment on our heads we cannot guarantee fit against other manufacturer’s tolerances in order to secure an adequate clamping force. We have tested samples from Arca-Swiss, Wimberley, Kirk, Markins, Kiwi, Foto-Pro, and dozens of no-name manufacturers, and they are all different. Arca-Swiss is a STYLE, not a STANDARD. 2. Our quick releases open/close much further than our competitor’s clamps to take up the slack of other manufacturers tolerances. We have twice as much clamping tolerance as most other quick releases on the market. 3. Quick release levers are prone to snag on branches, bags and clothing and possibly release, making them a liability in the field. 4. Our standard knobs such as the one on the JR 3 are very fast to open/close (faster than the lobed design on the our Pro head) and the size is appropriate for clamping pressure on small to medium telephoto lenses. Increasing the size may cause binding due to the ability to use excessive torque. We use a larger knob on the Pro head to allow stronger pressure for appropriate clamping strength, but it is a slower mechanism. 5. Our knobs are made from high-grade aluminum by a US manufacturer in a controlled environment. They can take a bashing, beating and continue to function day in and out. 6. We sell something like 5000+ of these knobs on various products per year. We have NEVER had a complaint about clamp design, not ONE. This is quite a testimonial. One of Jobu's points about the varying Arca-Swiss style plate sizes on the market is interesting, lets look at the the sizes of some common QR plates that you might even be using. All measurements are thickness (or height) x width. Looking at the above it looks like 9 x 38 mm is the most common size but some of the differences in plate dimensions are surprising, especially on two plates from 4th Generation. This is especially strange since 4th Generation uses non adjusting lever type QR clamps. 4th Generation designs M3.5a quick release lever type clamp. This is an older example but I believe the 3.6 clamp design is unchanged. In my personal experience the lever QR clamps can be quicker to close and open but the down side to this speed is the adjustment necessary to get a real safe and secure fit with your lens plate. In the last 5 years of using lever QR clamps out in the field I have adjusted dozens and dozens of clamps for photographers to fit the different QR plate brands. Many time I have had to adjust a brand new head right out of the box. 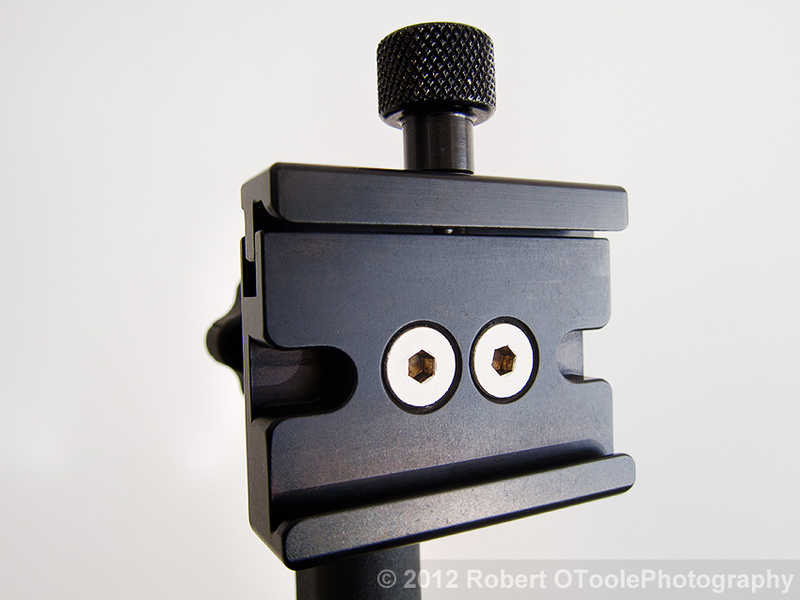 I have also had to adjustment a few famous photographer's lever QR clamp heads so they clamped properly. Its a shame that the lever QR clamp head dealers and manufacturers are not honest with buyers about this. In fact one Mongoose dealer has stooped so low as to spread false rumors about the Jobu Jr 3 clamps not to mention failing to inform customers about the drawbacks to the QR lever clamps they sell. Over the years I have used different Arca Swiss style quick release clamps and plates since the 1990s. I have used both knob type and lever clamps over the last 10 years including Wimberley I, Wimberley II, and Mongoose side mount lever QR heads. Currently I use Jobu gimbal heads with standard screw knob clamps and don't see any reason to ever go back to a lever QR clamp even thought they can be faster to open and close. I prefer the lower cost, extra security and lack of adjustment needed with the standard screw knob clamp designs. I hope this information helps you understand the differences in the various head designs so you can make the best decision next time you are in the market for a new head. All content (including text, design, photos, layout, and graphics) are copyright © 2011 Robert OToole. All rights reserved.